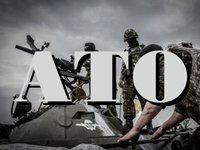 Over the past day militants opened fire 32 times on positions of Ukrainian troops in the Anti-Terrorist operation (ATO) zone, the press-service of the ATO staff has said. In particular, in the sector of Luhansk militants fired Novozvanivka from 120-mm mortars and rocket-propelled grenades, Talakivka and Stanytsia Luhanska – from propelled grenades, while Novotroyitske was fired by a sniper. In the Mariupol sector militants shelled at Maryinka using mortars, rocket-propelled grenades and small arms were used to attack Hnutove, Pavlopil, Shyrokyne, Maryinka, Krasnohorivka, Vodiane and Novotroyitske. Starohnativka was attacked by weapons of infantry combat vehicles. In the Donetsk sector members of illegal armed formations fired Troyitske vicinity with the usage of cannon artillery of 152 mm caliber, Avdyivka – with the usage of 82 mm mortars, Luhanske and Avdiyivka – with the usage of rocket-propelled grenades and small arms. In addition, one soldier of the Armed Forces of Ukraine was injured.